Using LOD expressions, a user can compute different levels of aggregations that are not at the level of detail of the visualization. If you want to improve your Tableau skills check out: Best Tableau Online Courses. In Tableau, we have 3 types of Level of Details expressions. These are “INCLUDE”, “EXCLUDE” and “FIXED”. As the name suggests, “INCLUDE” level of detail expression compute aggregations considering dimensions which are specified in the calculation and also take into consideration those dimensions which are present in the view. 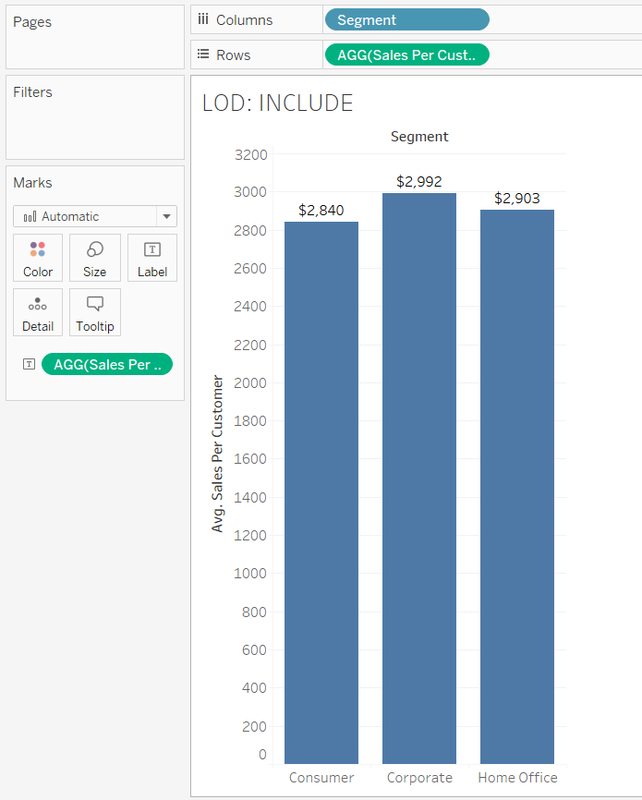 Check out this tutorial for a Deep Dive into INCLUDE LOD calculation. 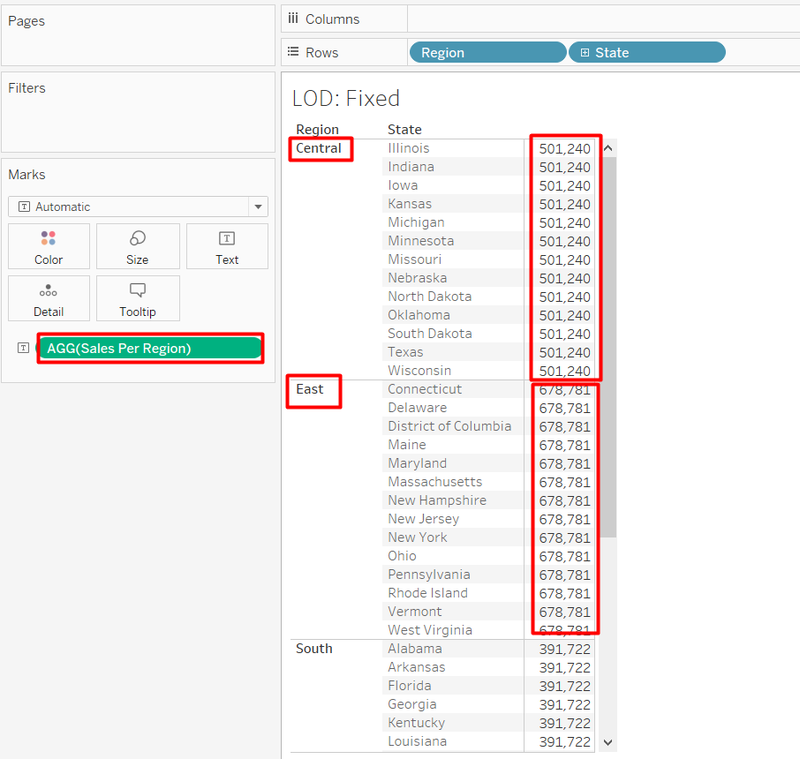 “INCLUDE” level of detail expression is used when a user wants to calculate values at the lower level of granularity and then aggregate and show the values at the higher level of granularity. Let’s consider the requirement is to compare the average customer sales across different product segments. In this case, although in the view we are going to show only “Segment” in calculations we need to include “Customer Name” as well so that average customer sales can be calculated. “EXCLUDE” level of detail expression is used to omit specified dimensions from the aggregations. 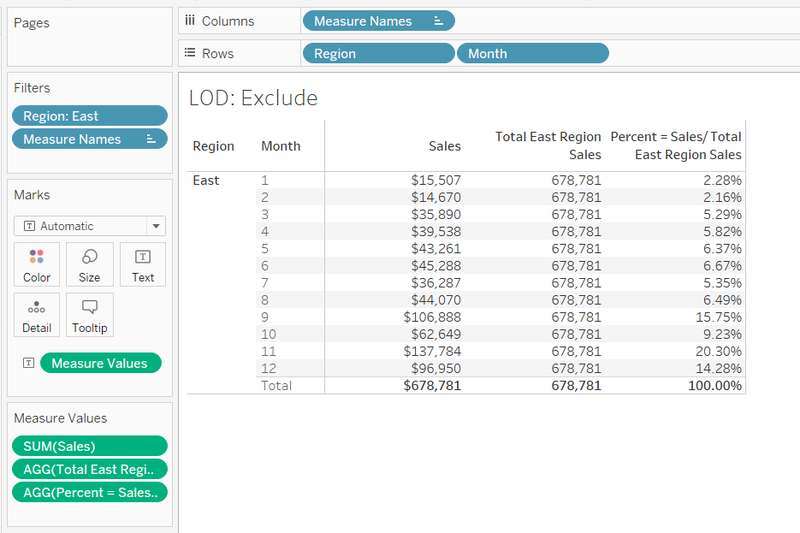 Using “EXCLUDE”, the user can omit the lower level granularity dimension which is present in the view and can directly calculate the value at higher granularity level. If you need more detail check out, EXCLUDE Deep Dive. “EXCLUDE” level of detail expression is majorly used to calculate ‘difference from overall average’ or ‘percent of total’. Let’s consider the requirement is to compare total sales with the monthly sales of the East region. To get the monthly sales we need to have “Region”, “Month” and “Sum of Sales” in the view. But, now to get the total sales of Region, we need to exclude “Month” in the calculation so that we can have total sales value for the region. Explanation: In the above formula, we are excluding the lower level of dimension i.e. Month to get the aggregate (sum) values of Sales at a higher level i.e. Region. “FIXED” level of detail expression aggregates the value only at the dimensions which are specified by the user in the calculation. “FIXED” expression does not take into consideration those dimensions in the view. If you need more detail, check out a LOD FIXED Deep Dive. Let’s consider the following expression which calculates the sales across regions.